Nearly every country in the world has a unique way to satisfy a sweet tooth. I’m still working on trying all of the best desserts in the world, but I’m not there quite yet, so I went to the experts! 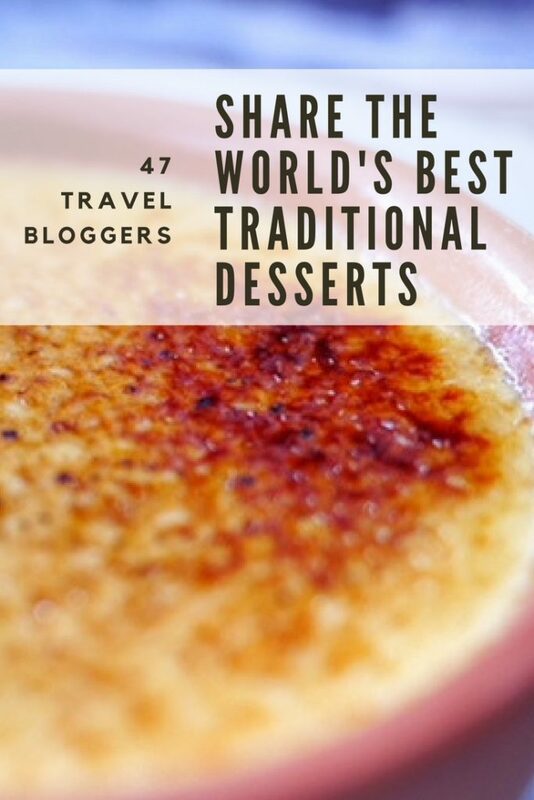 In this post, 47 travel bloggers share the best traditional desserts from around the world. Lamingtons are one of those Australian iconic desserts that we all love but rarely give it the respect that it deserves. Cited as being created by a maid of Lord Lamington in the early 1900’s we more often seen as an afternoon delight rather than the main affair. The Lamington could easily be considered as Pavlova’s ugly cousin. What is a lamington? It’s two slices of sponge cake, soaked in a chocolate mixture dipped in shredded coconut and wedged together with raspberry jam. If you are truly indulgent you might even have a dollop of cream in between the sponge cake. You’ll find the humble lamington in bakeries across Australia and making an appearance on afternoon tea plates and trendy desserts like freakshakes in Melbourne. I have selected the often controversial dessert pavlova, a traditional meringue dessert made from egg whites and caster sugar with a crispy crust and soft inside. Pavlova’s are generally topped with cream and come in a variety of toppings but the most popular would be fresh tropical fruit. Berries are very popular, as with passionfruit and kiwi fruit. My favourite is whipped cream with a crushed chocolate peppermint crisp, just to top off the sugar overload. 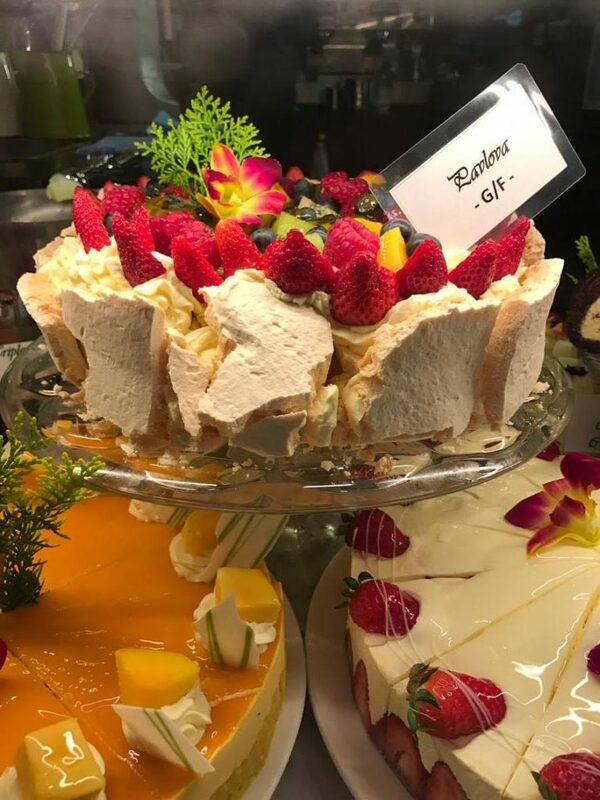 Now the origin of the pavlova has been long contested for many years between Australian’s and those Kiwi’s across the ditch who have claimed it as their own! Pfft, just like Marmite is better than Vegemite, I don’t think so! A quick google search tells me that pavlova was named after a Russian ballerina, Anna Pavlova on her tour of Australia and New Zealand in 1920. Either way, I’ll continue to enjoy our decadent sweet dessert on Christmas Day and better still on Australia Day topped with a cute little Aussie flag stuck on top at a BBQ and washed down with an ice cold beer! Sacher torte is one of the most famous desserts from Vienna. Torte is German for a two-layer cake, which is exactly what this decadent dessert is: two dense chocolate layers with a sweet apricot jam in the middle. The icing is a dark chocolate glaze and it if often topped with unsweetened whipped cream. This mouth-watering cake was made by Franz Sacher for the Austrian prince in 1832. The cake is still being made today and can be found at the Hotel Sacher cafe in Vienna where they still use the original recipe. Or they can ship the cake to you almost anywhere in the world! Even with all the new cooking trends popping up, some of the classic Austrian dishes are simply unbeatable. With a rich history, Austrian cuisine has been tweaked and perfected over centuries—dumpling are one particularly popular item on many tables. In Austria you won’t only find dumplings served alongside hearty meat dishes, but also served as sweet dishes for a dessert or sweet meal. One style that I tried while traveling through the Waldviertel in Lower Austria was the Marillenknödel, which was cooked by the grandma of the farm I visited. Let’s just say it was delicious—tart and sweet. 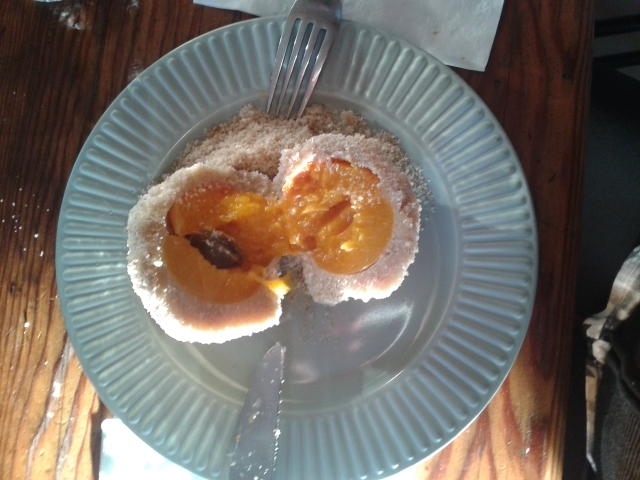 Essentially it’s a fresh apricot surrounded by dumpling dough, boiled, then covered with toasted bread crumbs and a light dusting of powdered sugar. It’s obvious why it’s among the most popular and famous desserts in the region. Marillenknödel are a traditional meal of Austrian-Bohemian cuisine. 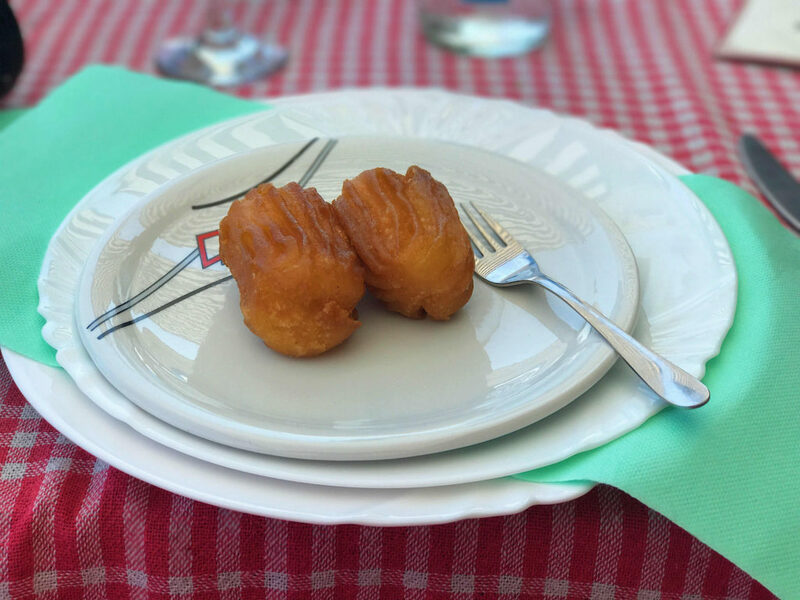 On the dessert menu of some restaurants in Vienna, and especially in the Marillen region of the Wachau, you can find this delicious Austrian dish. Originally from potato dough the dumplings are now preferred from dough using cheese curd (“Topfen”), making the Marillenknödel taste particularly light, fresh and fluffy. A little tip: A bit of cinnamon in the breadcrumbs completes the dish excellently. In Quebec, Canada, classic desserts are all about the satisfying sweetness of maple syrup. Canada produces 85% of the world’s maple syrup, most of it from Quebec. Traditionally, Quebecers gathered to celebrate the end of a long winter at sugar shacks, where sap from maple trees is boiled down into syrup. They would enjoy pancakes and crêpes, with fresh bread, ham baked beans and meat pie, all of it smothered in maple syrup. Clearly, this is what’s required to recover from a Canadian winter. 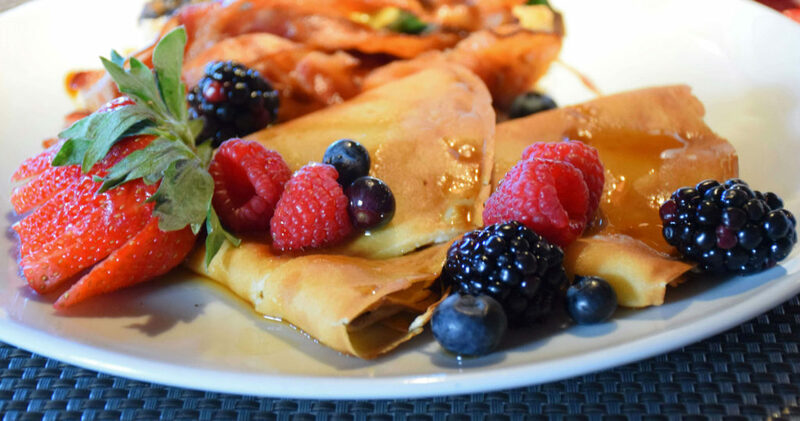 Now, you can enjoy these delicious crêpes – thin pancakes made from wheat flour – drenched in pure maple syrup at Chez Muffy in Quebec City, either for breakfast or dessert. Other traditional maple desserts include sugar pie and taffy, made by pouring boiling maple syrup on snow. It’s maple goodness you can’t miss. My contribution is the Croatian doughnut, known as Krafne, which is also popular in other countries such as Slovenia, Bosnia and Serbia. Krafne are made of flour, milk, yeast, sugar, butter and eggs and are usually enjoyed on Shrove Tuesday (instead of pancakes) and at other times during the winter months. Once the dough is made, round circles are cut from the dough and placed in a pot filled with hot oil. The Krafne are deep fried until they are a golden colour. Once the Krafne are ready, they are placed on a tray to cool down, and then are sprinkled with icing sugar. Inside, the Krafne are quite airy, and often Croatians will fill them with jam, marmalade, or Nutella (plum jam is my personal favourite!). Visiting Croatia? Here’s how you can spend an awesome day in Zagreb. A deliciously wicked smell of baked goodness wafting through your nose would most likely be your first experience of a trdelník. A street food staple among the many corners of Prague, you can easily find stalls selling this sweet treat. The sugary, pastry smell will call out to you as you roam the streets of Prague. 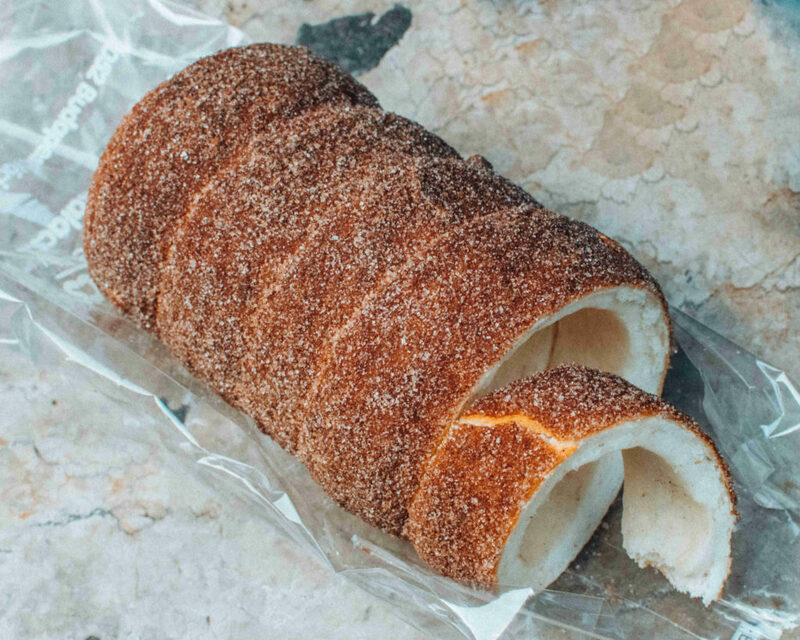 Basically, a trdelník is a sweet, cylindrical pastry made from rolled dough, wrapped around a wooden or metal stick called a ‘Trldo,’ then roasted over an open flame to achieve a golden brown perfection, and dusted with sugar, cinnamon, and walnut mix afterwards. Today’s modern version is filled with chocolate, vanilla, or Nutella, and even scoops of ice cream! While this European chimney cake is famous in the Czech Republic, it actually originated from the Hungarian-speaking region of Translyvania. Now, it’s widely-available throughout Central Europe. As most stalls bake trdelník on the spot, tourists are treated to a fascinating, first-hand viewing of how this spit cake is made. On a cool day, trdelník is best paired with mulled wine but on a cold winter day, it’s perfect with Horká čokoláda or hot chocolate. The next time you are in Prague, dig into the goodness of trdelník, with its crunchy sugar-coated crust! 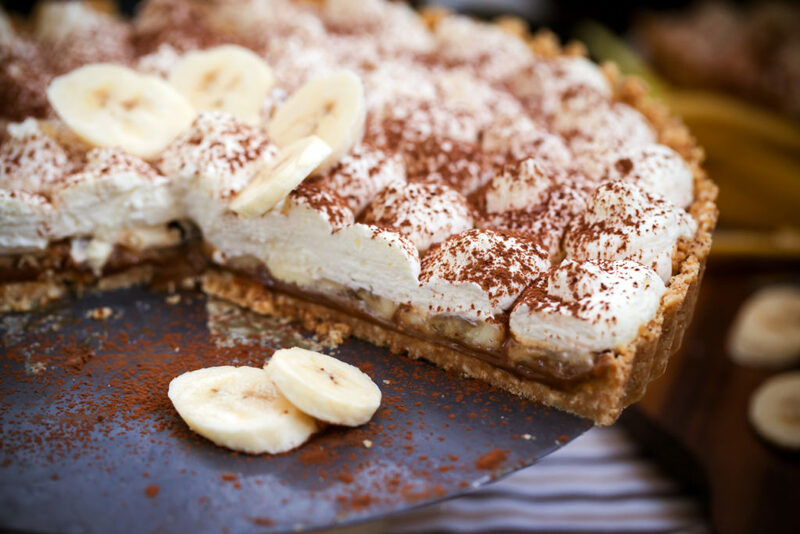 Full of all things naughty, nothing says Sweet England more than Banoffee Pie. The tantalising combination of bananas, cream and toffee on a pastry or biscuit base is completely irresistible. This English dessert pie is easily made with condensed milk so even the novice chef can be successful. I first tasted this treat when I lived in London, may years ago, and it wasn’t until more than a year later did I realised that ‘banoffee’ actually was a hybrid of the words ‘banana’ and ‘toffee’. Sometimes these pies are made with additional chocolate or coffee and can even be found topped with fruit. But I am a traditionalist and prefer the original! Prefer a trendier dessert instead of this classic? 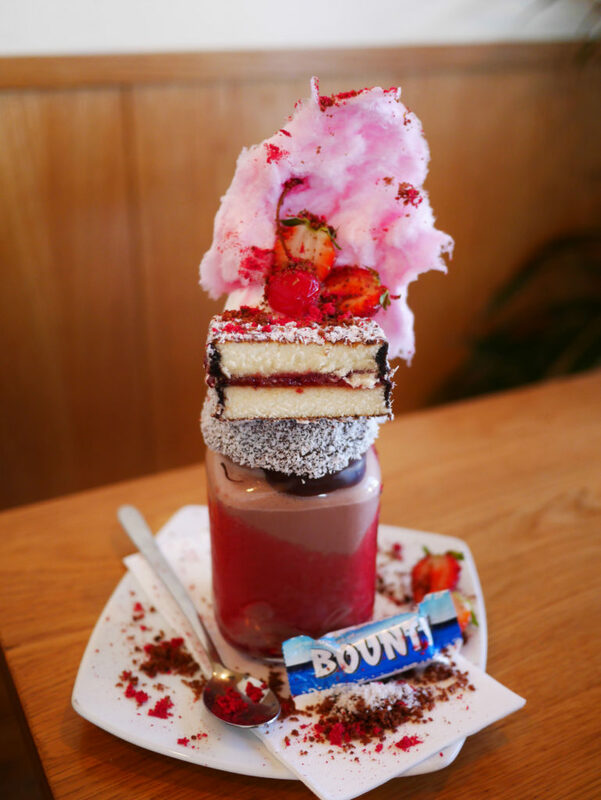 Check out London’s best freakshakes. Crème brûlée is one of the most famous desserts around the world. It’s on every French menu, but its history is a little more complex. Similar to the controversy over pavlova, crème brûlée’s origins are also widely debated. 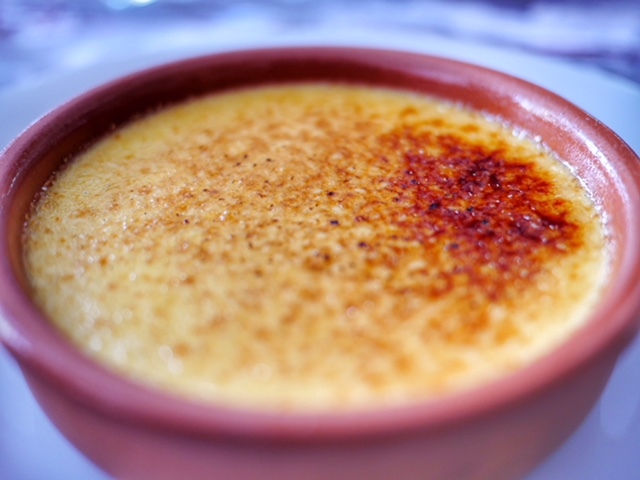 France, England and Spain claim ownership of this dessert, but the earliest printed mention of crème brûlée is by a cook at the Palace of Versailles in 1691 in the French cookbook Le Cuisinier Royal et Bourgeois. Crème brûlée is a custard made of egg yolks, sugar and heavy cream, and finished with a sprinkle of sugar on top that’s burned to create a crystallized layer. Any dessert that’s made with a blow torch earns an A+ in my book! Check out these quirky foodie experiences in Paris or learn secrets in Julia Child’s kitchen in Provence. 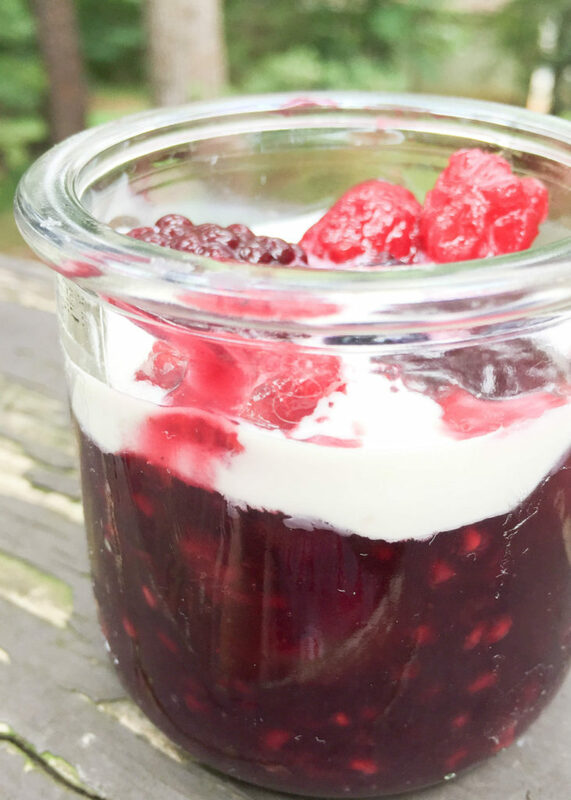 Rote Grütze is a delicious traditional summer dessert from northern Germany. Like berries? You’ll love Rote Grütze! I first tried it at a friend’s house a few weeks after I moved to Hamburg as a teen. Two and a half decades later and it’s still one of my all-time favorite German desserts. Rote Grütze is basically a thick dessert soup comprised of berries, cherries, and currants sweetened with a bit of sugar and red fruit juice and thickened with corn starch. My German friends served Rote Grütze warm with fresh cold cream poured over the top. So good! Other people, however, prefer Rote Grütze with vanilla sauce or ice cream, and some people prefer to eat it cold. Rote Grütze is super easy to make from scratch but if you’re in Germany (especially northern Germany) you’ll find a jar of it in any grocery store. Rote Grütze the perfect local dessert to make in your AirBnB! Visiting Germany? 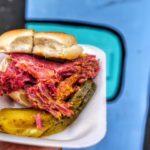 Be sure not to miss these 20 foodie experiences in Düsseldorf! 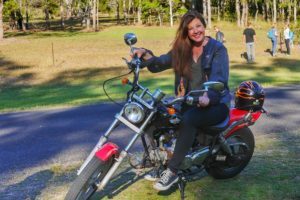 There is one cake that I truly love…I have had it plenty of times in Australia and I thought it was pretty good, until I actually visited where it was from. 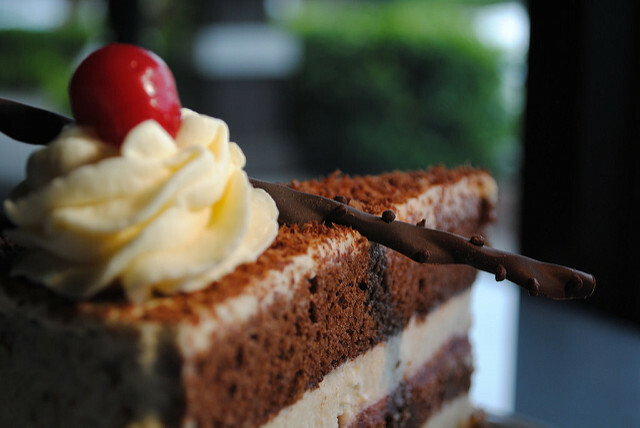 Black Forest Cake in the Black Forest is like nothing you will ever have again…a true slice of heaven. The pieces they serve there are big enough for two people to enjoy together. While you think it will be sickly sweet it isn’t. The chocolate cake is light and fluffy and with the black cherries throughout it is perfect. The fresh whipped cream (none of that tinned stuff on this cake) on the top with cherries in a syrup makes you want more and more. It is a real art to get one of these cakes perfect and I am so glad that we had a traditional one in the heart of where it came from made in a family run cake shop. 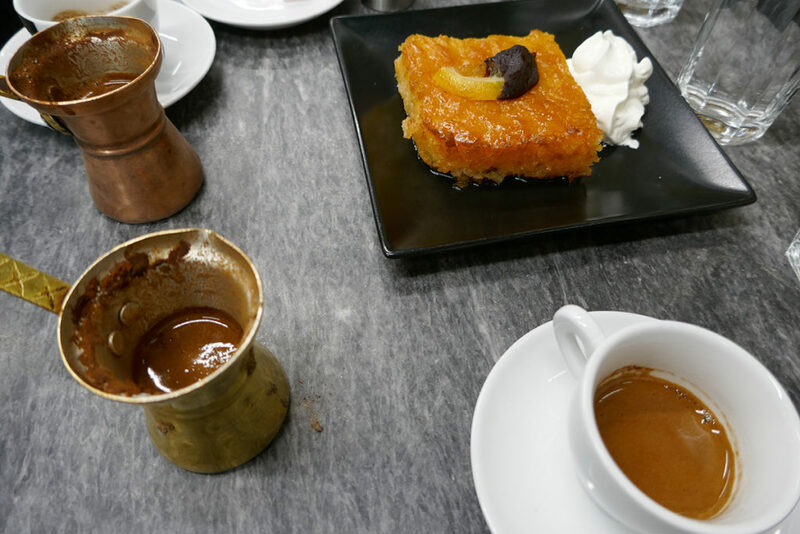 On a food walking tour in Athens, our local guide took us to the renowned coffee shop Mokka, where they make their coffee in hot sand. This in itself was, a unique experience, but paired with the Greek traditional dessert of Portokalopita, or Traditional Yogurt Cake with Orange Syrup then our food experience got even better. Portokalopita is Greek yogurt cake made with fresh oranges, yogurt, phyllo pastry, and cinnamon. 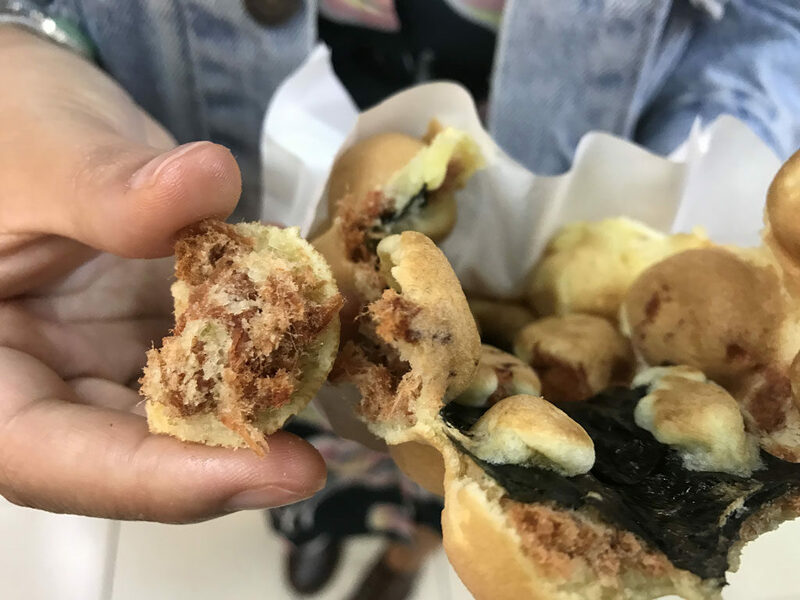 Egg waffle might not be hundreds of years old, but this snack that originated on the streets of Hong Kong is a favourite among the people. Also called eggettes or bubble waffle, it is basically a fancy version of waffle but also so much more. The best egg waffles are crispy on the outside but soft and chewy on the inside. Nowadays, you can also get different flavours of egg waffles. You can go sweet with green tea, chocolate or savoury with cheese. You can buy it on any street corner stores, however, for the best egg waffles, you would have to try the best stores. Here are a list of my favourite egg waffle places. 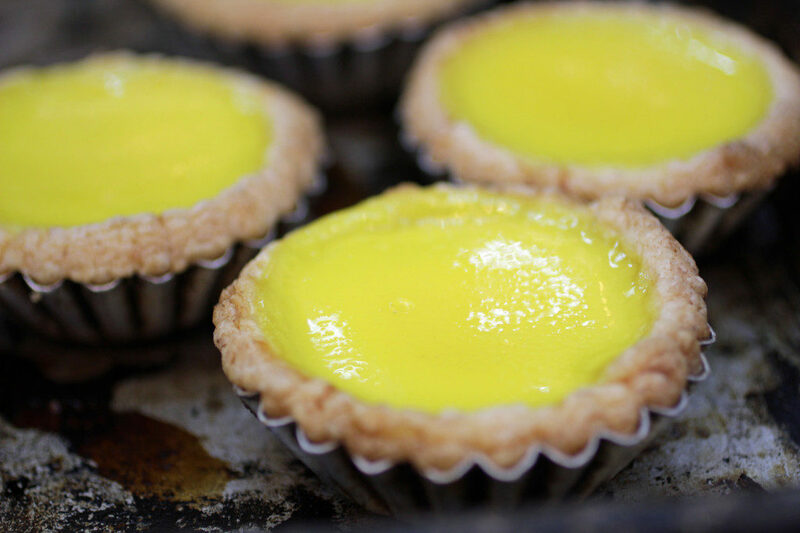 Originally a Portuguese dessert that made its way to Macau when it was a Portuguese territory, the egg tart finally made its way to nearby Hong Kong. There is much debate about which version is the best, and I’ve tried them in all three places. For me, maybe since I tried it there first, I love the version made in Hong Kong. I don’t have much of a sweet tooth so these are great for me- not too sweet and the crust is flaky and buttery. The crust holds a yellow custard which often times has a bit of a crust on the top from the baking process. You can find these at every bakery in Hong Kong and also at stalls along the streets. I love them when they’re fresh out of the oven and still warm! 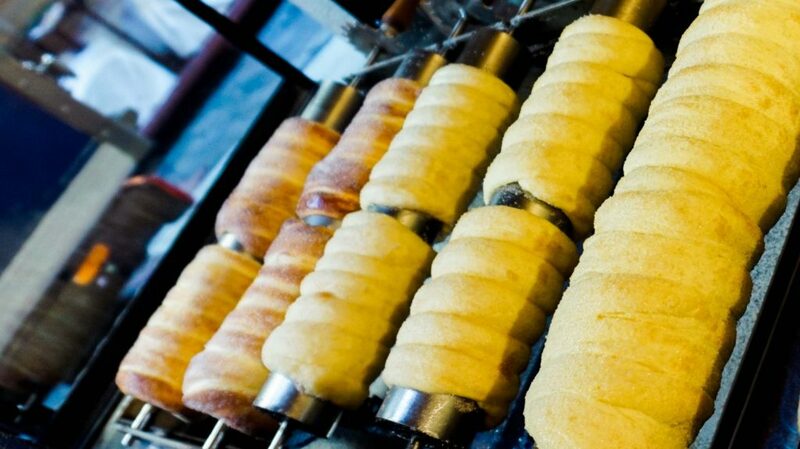 If you like sweet doughy desserts, you’re bound to love Kürtőskalács (also known as Chimney Cake) – a traditional Hungarian delicacy loved by locals and tourists alike. Despite its hard-to-pronounce name (don’t even ask me how!) the premise is pretty simple. It’s a single piece of sweet dough wrapped around a giant rolling pin before being rolled in sugar and baked over hot coals. You can then ask for it to be topped with cinnamon, coconut, chocolate, nuts or poppy seeds depending on your taste. On a recent trip to Budapest, I visited ‘Molnar’s Kürtőskalács’ to try it for myself. Molnar’s is a real, working bakery where you can watch the whole baking process from start to finish. For 900 HUF (about £2.50), you can tuck into one of these beauties on site or take it to eat on the go. Fair warning – though they may look small, they are mighty filling so I highly recommend getting one to share between two! The overall verdict? While I would say the texture is more bread-like than cake, the cinnamon one I tried was very tasty and I really enjoyed peeling off sections of the dough and throwing them into my salivating mouth. 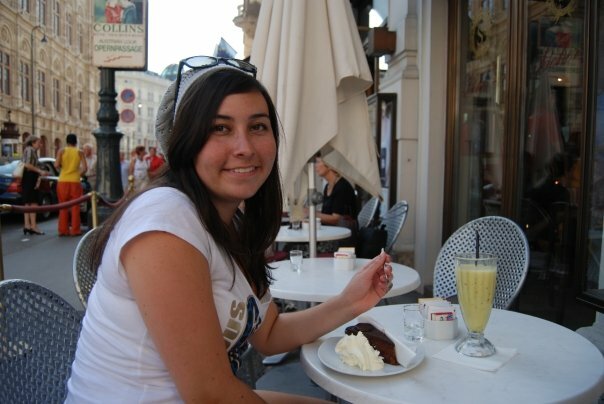 This is one dessert you have to try when in Hungary! 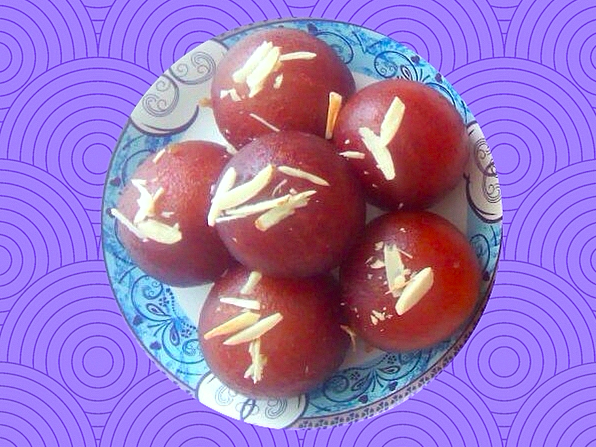 The Gulab Jamoon can be truly called as the signature dessert of India. It shines bright amongst the mesmerising array of sweets that make up the Indian Dessert firmament. In a country with a rich diversity where languages, cultures, and cuisines change as you travel a distance of a 100 miles, Gulab Jamoon is a common denominator which people recognise and love. The origins of this sweet temptation dates back to medieval India. According to a myth the sweet was first dished up by an “accident”, by the personal chef of the Emperor Shah Jahan. Of course Shah Jahan is famous for getting the Taj Mahal built in Agra. The Gulab Jamoon is made by preparing a dough of solidified milk with a little bit of all purpose flour and a dash of cardamom. 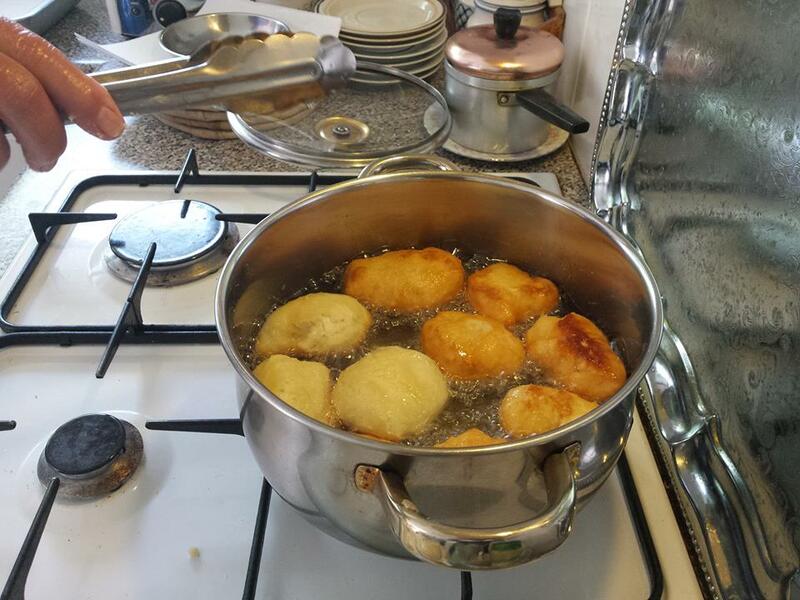 The dough is then shaped into small balls which are deep fried. 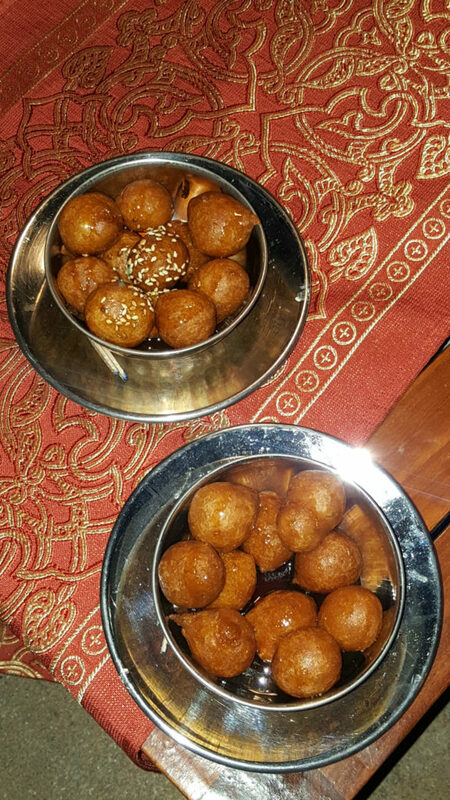 The fried dough balls are then immersed and soaked in sugar syrup flavoured with rose essence. The name Gulab Jamoon is a complex word formed by Gulab which means rose and Jamoon which refers to an Indian fruit of a dark purplish colour. Once the Gulab Jamoon is ready it assumes a dark colour and hence the name Gulab Jamoon. Any restaurant or sweet store in India worth its salt will have Gulab Jamoon on its menu. This dessert is also prepared in the kitchens of millions of households across the country on festive occasions and events like weddings, birthdays, parties, just anything that warrants a celebration. This is our favorite dessert and we often have it! Gulab jamoon was my favorite treat in Kerala! Here’s a full list of the best sweets of Kerala. India’s landscape and culture is so vast that even moving from one city to another will give you a completely new range of tastes and flavours. But when it comes to desserts, one dessert that is found almost everywhere in India, and used to celebrate almost every festival, wedding, and party is the barfi. It’s also spelt barfee or burfi, and is as ingrained in Indian culture as the laddoos, gulab jamuns, gajar halwa and pedas are. Barfi is made from a mixture of condensed milk and sugar that is cooked till the milk solidifies, and then cut into squares or diagonals before serving. The most common form of barfi is the malai barfi – white in color with sliced pistachios or almonds sprinkled on top. Sometimes the barfi is covered with edible silver leaf. This soft textured sweet almost melts in your mouth. From this basic barfi are derived all the other combinations of barfi – kaju (cashew) barfi, mango marfi, pista (pistachio) barfi, chocolate barfi, gulab (rose) barfi, anjeer (fig) barfi, pineapple barfi, coconut barfi, and so many more. Every time I get to the store, I can’t help but come away with a few boxes of barfi. 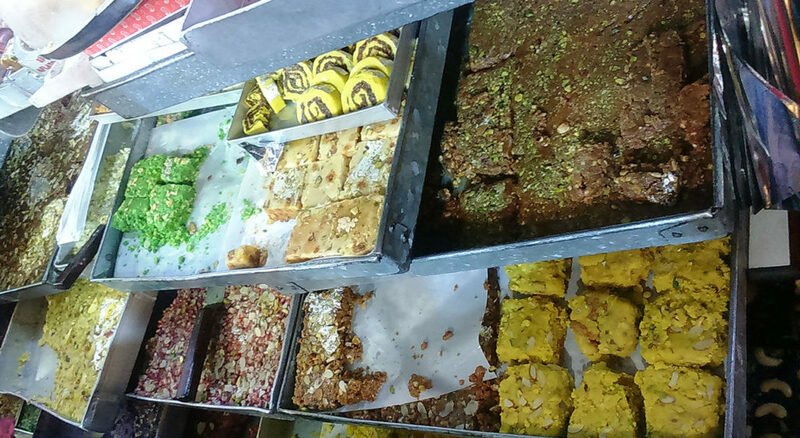 This picture, taken in a sweet shop in Bombay, shows chocolate barfi, coconut barfi, malai barfi, anjeer barfi, strawberry barfi, malai barfi, pista barfi and more. I have a hyper-active sweet tooth and I am constantly on the hunt for good desserts after food. This is true even in my travels. I always search for the best local dishes and especially desserts to try. On my recent trip to Salem in Tamil Nadu, India, I tasted delicious Badam Halwa (Almond pudding) and got hooked to it. I even looked up how to make it without sugar and tried it at home! That is how much I loved this tempting almond dessert. 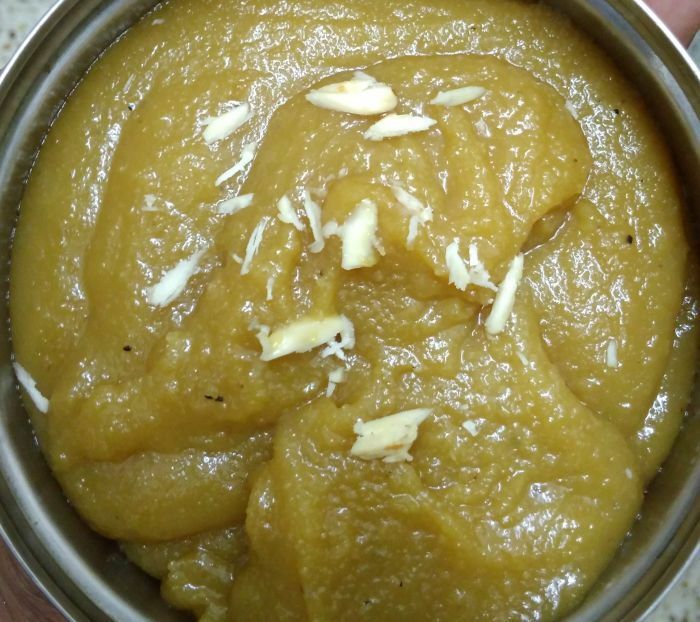 Badam Halwa is especially famous in South India and is made when celebrating important festivals like Diwali. India is a diverse country and such diversification can be seen not only in varieties of culture and religion but also in Indian cuisine. And when it comes to Indian cuisine it is incomplete without desserts. Indian desserts are the heart of Indian cuisine. Desserts give a perfect end to any meal, and Indians we have a penchant for sweets. Among all Indian desserts one of the most popular dessert is Raj Bhog. Raj Bhog also called the king of desserts. Its name literally means that it’s for the king’s palate. Raj Bhog is a popular Bengali dessert made during festive season. This Bengali delicacy is a syrupy dessert made with Paneer (cottage cheese) also called chena and is quite similar to Rasgullas. The only difference here is that Raj Bhog is bigger in size, colour and is a two layered sweet with a khoya core and a Rasgulla type shell. Raj Bhog is stuffed with mixture of khoya pistachios and almonds, however it can even be made without khoya with the remaining stuffing. It is flavored with cardamom powder and saffron. Cardamom & saffron aroma is the essence of Raj Bhog. Saffron is the spice of royalty and is also a key ingredient of Raj Bhog as it imparts a rich golden yellow colour to Raj Bhog. Raj Bhogs are mostly served chilled and it is a very soft, spongy, rich and yummy sweet that can be quickly made at home in an easy and simple way. It is a perfect recipe for beginners. So make your festivals more colorful by making this delicious toothsome and nutritious desert at home. Coming from the Eastern part of India, eating desserts is a way of life. We can eat desserts for breakfast, lunch and dinner. But one of our favourites remains the Rosogulla. 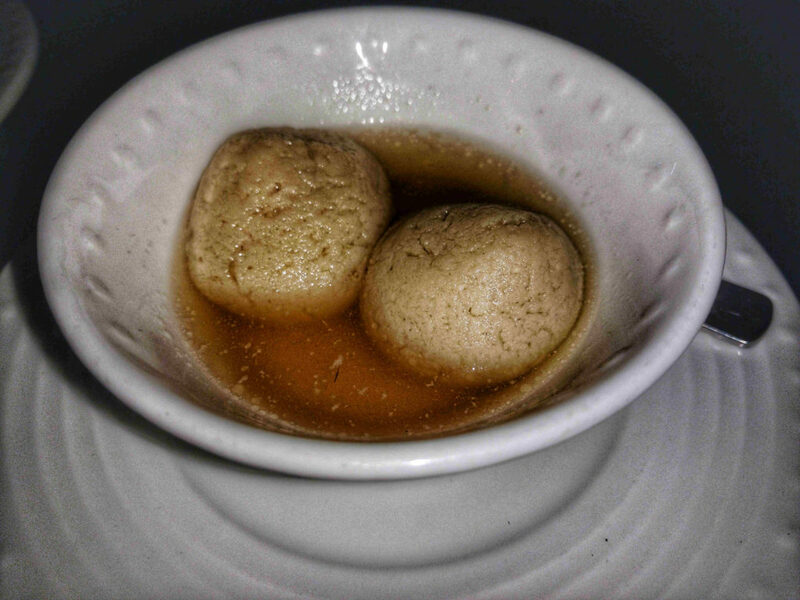 It is a soft ball of curdled milk allowed to soak in a sweet syrup for long hours. The syrup can have a bit of jaggery added to it while the whole mixture can be baked for 15 seconds to give it another layer of flavours. This dessert is usually found in Kolkata. Noodles… for dessert? As a noodle addict, it seemed too good to be true. 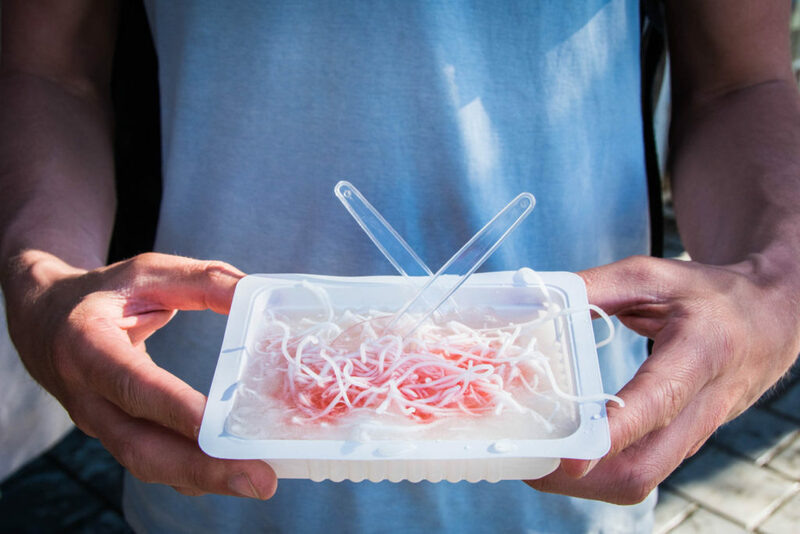 But that’s precisely what Iranian faloodeh is: thin, vermicelli-like noodles drizzled with syrup. I dove into my first helping of faloodeh on a warm spring day in Kashan, Iran. While some of Iran’s neighboring countries like to douse their versions of faloodeh with heavy syrups and ice creams, Iranian faloodeh is more of a light, refreshing treat for a toasty afternoon. The noodles by themselves are relatively tasteless, but when mixed with a semi-frozen sauce of sugar and rosewater, they end up tasting a bit like rose sorbet. If you ever find yourself melting in Iran, faloodeh just might be the solution to your troubles! Italians pronounce this clam shell-shaped Italian pastry Svoo-ya-dell and it’s one of the most recognizable and delicious pastries in all of Italy. You’ll find them in restaurants and markets all around central and southern Italy, but Campania is it’s original home. 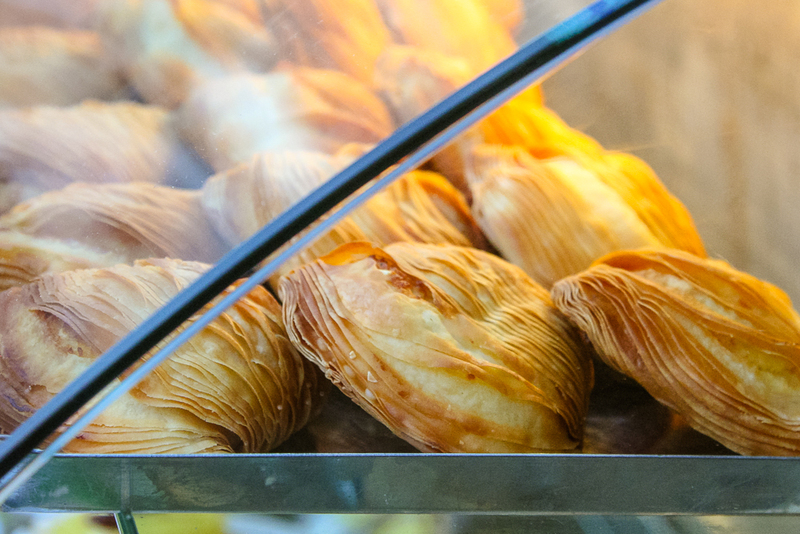 In fact, it’s very common in Naples to see sfogliatelle stands around the city streets selling just these pastries. The traditional sfogliatelle is filled with sweetened ricotta cream, semolina, cinnamon, and sometimes lemon zest or candied orange bits, and the flaky layers separate during baking, creating a yummy textural contrast to the soft filling inside. It’s not the easiest thing to eat, but it’s perfect with an espresso. Best to dive right in and just take a big bite! As soon as you arrive in Sicily head straight for the nearest pasticceria. There is not a moment to lose. You must try authentic Sicilian cannoli – it’s one of the most delicious things I have ever eaten. I’m sure you have tasted cannoli before, it’s such a popular dessert, but you haven’t really lived until you have tried Sicilian style cannoli. In Sicily, cannoli is made to order. Fresh whipped ricotta is piped into crunchy pastry shells and dotted with chocolate chips, pistachios or candied fruit. The contrasts of texture and taste make this dessert special. 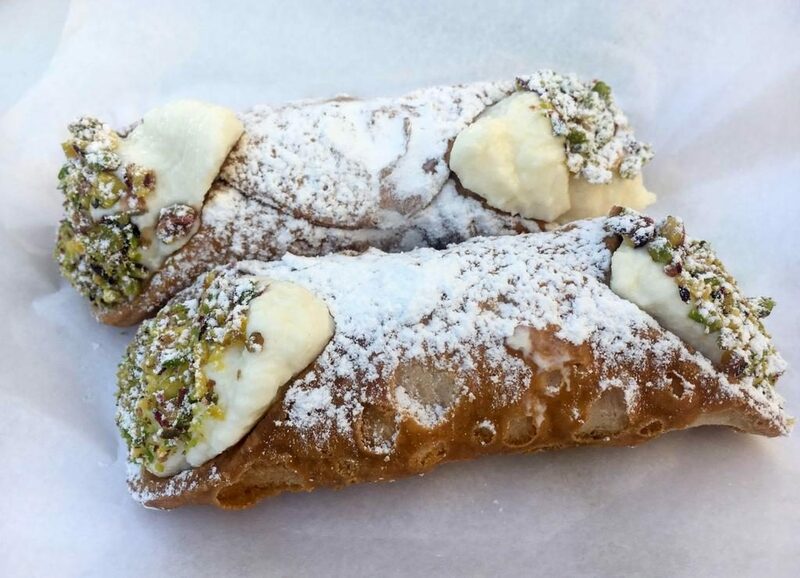 Sicilian cannoli is not too sweet and so you will convince yourself to eat another. And another. Delicious. Bonet is a pudding of ancient tradition, typical of Piedmont, made from eggs, sugar, milk, cocoa, liquor (usually rum) and dried amaretti. The traditional Piedmont bonet, homemade by grandmothers, was not rum, but Fernet, because, after the meal was over, Fernet served to speed up digestion. Cold eggs, milk, sugar, blackberries, rum and, possibly cocoa blend together. The recipe can undergo variations depending on the Piedmont area. And of course, there’s always gelato! Here’s The Sweet Wanderlust’s top tips for where to find the best gelato in Florence. If you visit Japan in the summer, you will be eating lots of ice cream to stay cool. Matcha ice cream is the signature flavor and is a must to try. Matcha powder is finely ground specialty green tea leaves and is known for its calming powers. 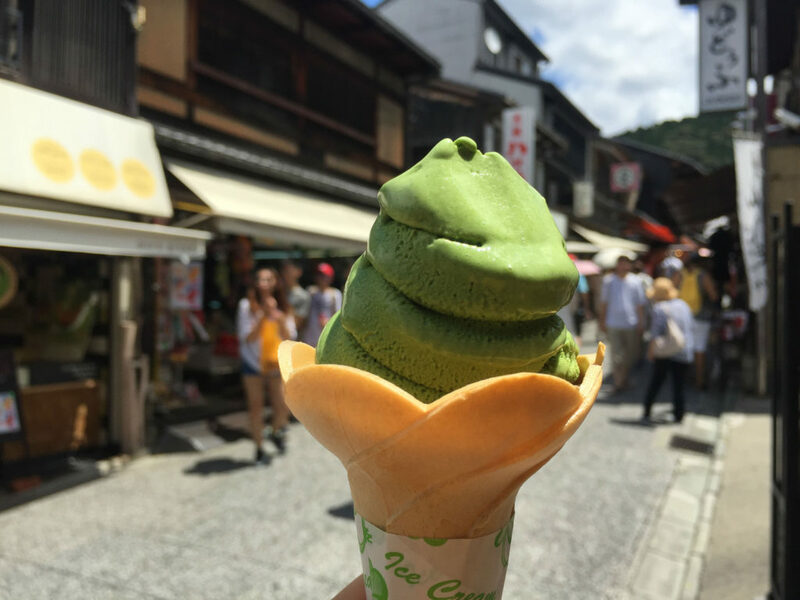 All over Japan you will see matcha flavored desserts from cakes to jelly to ice cream. They even make matcha flavored Kit-Kat bars! The matcha ice cream is soft serve ice cream usually served in a flower shaped cone. If you haven’t tried matcha flavor before, it might take some getting used to. It has a umami taste thanks to its sweet and savoury combination. Once you have tried matcha ice cream, experiment with matcha parfaits, matcha shaved ice and matcha cakes. One of the best ways to experience a culture is by dining on its delicacies. When we visited the country of Jordan, the people welcomed us with open arms and open kitchens! We kicked off our sweet trip to Jordan with breakfast at a traditional kanafeh shop named Habibah Sweets. We visited the original shop beside Al Bank Al Arabi in downtown Amman that was created in 1951. Kanafeh is a Middle Eastern cheese pasty that is created with butter, nabulsi cheese, phylo dough, sugar, and rose water and topped with a sprinkling of pistachios. 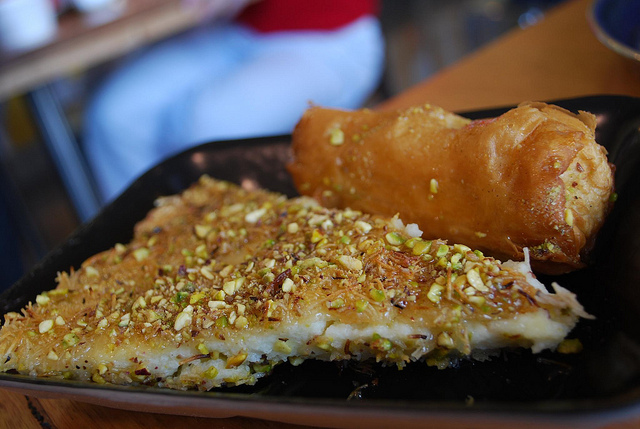 A bite of kanafeh fills your mouth with sugary, sweet, crunchy goodness. The melted cheese and warm dough create a savory and sweet mixture of tastes unique only to kanafeh. On a recent trip to Macedonia, I splurged and booked a local guide to take us on an adventure. After exploring the St Archangel Michael cave church is Radozda near the Macedonian/Albanian border, we stopped at a little restaurant on the banks of Lake Ohrid for lunch and for what would be the most mouth watering dessert of my life! The Macedonian Tulumbi may be confused as a form of Spanish Churros but it was s so much more! Fried in hot oil, that’s where the similarity ends because in Macedonia, these small desserts are then soaked, at least over night, in a sweet syrup. While the thought of a sweet syrup may lead you to wonder if these desserts are soggy, they are anything but. With the right oil when fried, the tulimbi maintains its crispness on the outside and becomes a gooey deliciousness inside. If you ever come across it, choose the golden ones which will indicate that they have been cooked to perfection. 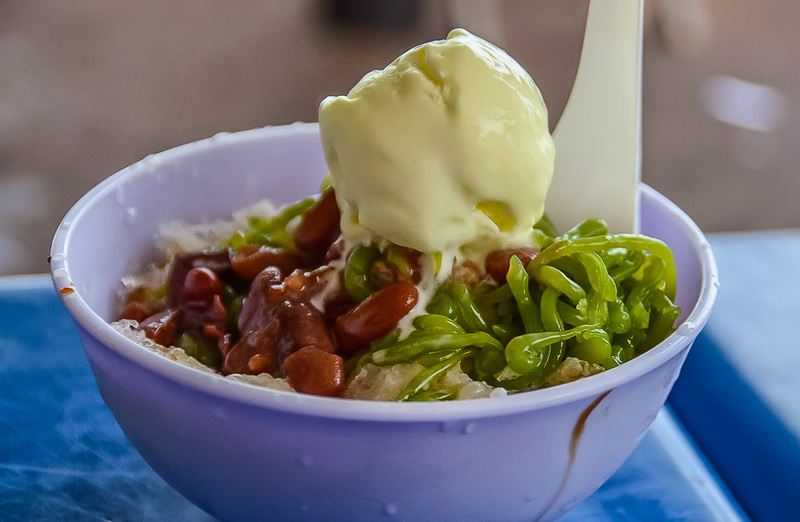 Ais Kacang is a traditional dessert not only in Malaysia, but also in Singapore and Brunei. Known also as ABC (Air Batu Campur) it is shaved ice with many additional ingredients, the most typical being red beans. Sounds surprising? Yup! But it tastes really good. Originally the ice was “shaved” manually and the whole dessert depended on the availability of ingredients, most common being fresh fruit (durian, watermelon), coconut milk, palm sugar syrup and, of course, red beans. We had our first Ais Kacang in a small restaurant in one of the numerous night markets in Ipoh. We shared one portion between the four of us and we all had a big bite. Our Ais Kacang consisted of shaved ice with multi-color syrup, red beans, roasted peanutscubes of jelly, agar-agar, watermelon, mango and was topped with condensed milk. One for four! To be honest, we were quite surprised to see that others were having full portions only for themselves. It is a very common dessert, sold mainly in night markets and street food stalls. Delicious, full of colours and taste. Definitely something to try in Malaysia! Wherever we are in the world, trying local dishes is at the top of our list of things to do. To say we have a sweet tooth is a bit of an understatement, so it won’t be long after arriving in a new country until we’re devouring a local sugary treat. Malaysia has to be our favourite food nation, the crazy amount of tasty national dishes available is welcomingly overwhelming, and plenty of sweet desserts are included. Our favourite Malaysian desert is Cendol which we discovered in beautiful George Town Old Town on Penang Island. It may look like something served at a 5 year old’s birthday party, but people of all ages across the country love it and is, therefore, a national favourite. Cendol is a rich creamy dessert and is made slightly differently depending on where you order it. The standard recipe is made with shaved ice, coconut milk, green starched jelly noodles with pandan flavouring, red beans and palm sugar. We’ve also had it with sweet corn thrown in which we know doesn’t sound nice, but it actually works! If you want to take Cendol to another level, then try to find somewhere that serves it with a generous scoop of ice cream on the top. Delicious! 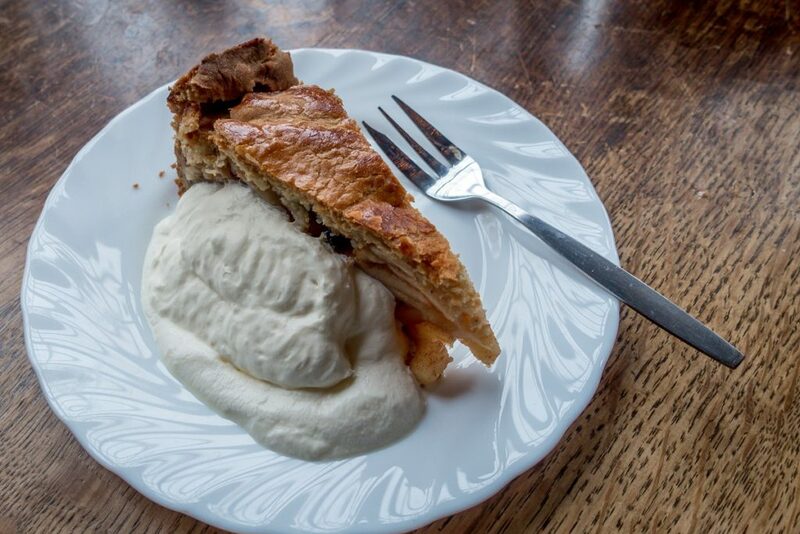 For more than five centuries, Dutch apple pie has been a treat in the Netherlands. Piled high with apples and raisins mixed with cinnamon and sugar, the pie can have a crumb crust or a lattice one. The type I tried in Amsterdam had a thick lattice crust and was topped with whipped cream. For the Dutch, apple pie isn’t just a dessert—it’s often eaten at breakfast with coffee or as a mid-afternoon indulgence. While Dutch apple pie can be found in many restaurants and cafes in the Netherlands, one of the best places to try it is a traditional brown café. These pubs—many of which are nearly 400 years old—are named for their dark wooden interiors, and locals often treat them like an extension of their living rooms. Many brown cafes have been serving some of the same dishes for hundreds of years. At the one I visited in Amsterdam’s Jordaan neighborhood, their apple pie recipe goes back six generations. 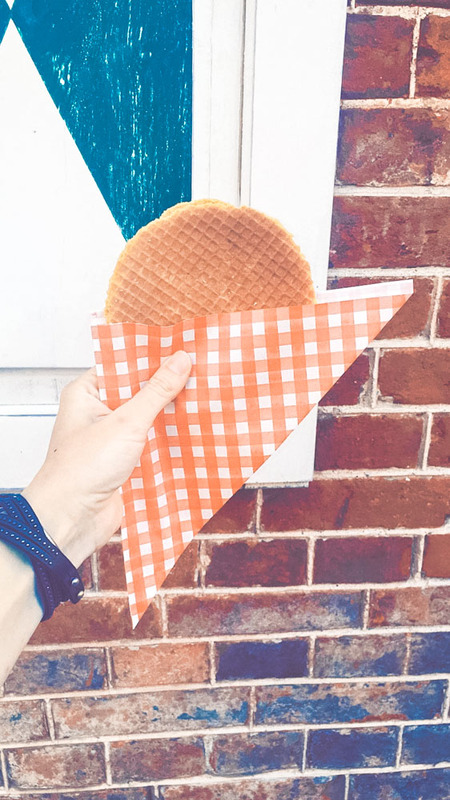 Up until heading to Potsdam for a day trip from Berlin, I thought I’d be crossing off stroopwafel from my food bucket list in Amsterdam as it’s a well-known Dutch treat originating from the city of Gouda. That is until I crossed into the Dutch Quarter of Potsdam. With 130 red brick buildings still standing, the Dutch Quarter was constructed in the 18th century for Dutch immigrants coming in as much-needed craftsmen for Germany. I smelt its warm gooey caramel-like syrup before I actually saw the stroopwafel street vendor. But when I finally set sight on them, I knew right then and there I’d be consuming my very first stroopwafel. And let me tell you, it was most definitely not my last one. Perú might be famous for its ceviche, but they also do really well in the dessert department. 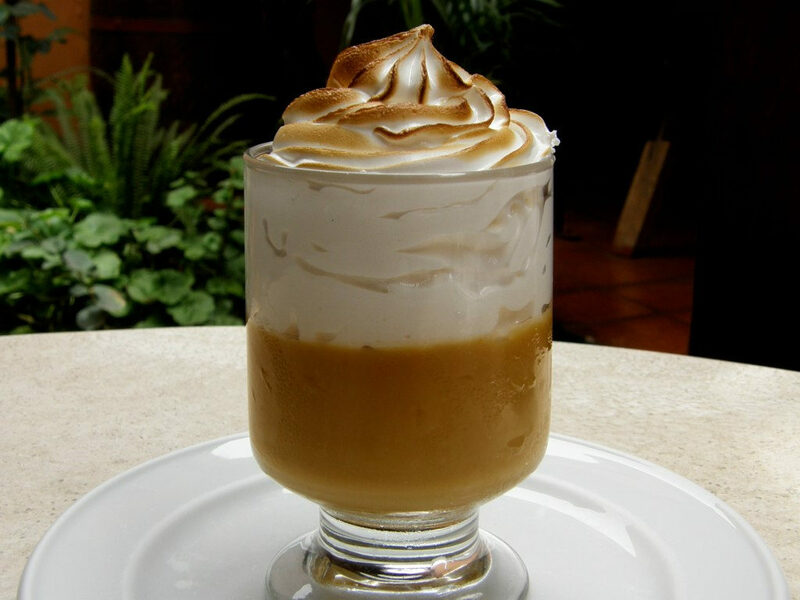 Enter Suspiro de Limeña, a dessert so sweet it should be followed by a trip to the dentist. The bottom layer is a generous heap of manjar blanco (also known as dulce de leche), a milky caramel with a silky texture and brown color. The top layer consists of elegant meringue spikes or twirls dusted with cinnamon. While most ingredients arrived to Lima’s shores with the Spanish colonizers, nobody put it together in its current form till the 19th century. Spoon it up the fancy way in a Peruvian restaurant starting at US$2.50, or get it ready-made in the delicatessen department of a supermarket for just US$0.90. It’s been named after a woman’s sigh in a very stereotypical and mildly offensive way (“sweet and soft”). I prefer comparing it to sticky and sweet joy in a jar. To be consumed sparsley and alongside a glass of water. Halo-halo literally means “mixed”. Basically, it’s a dessert of shaved ice mixed with various ingredients, typically served in a bowl or tall glass. At the bottom, there’s gulaman (agar-agar), tapioca pearls, beans, slices of sweetened saba (plaintain), strips of sweet mango and jackfruit, and pinipig (toasted rice grain). Other fruits can also be added. 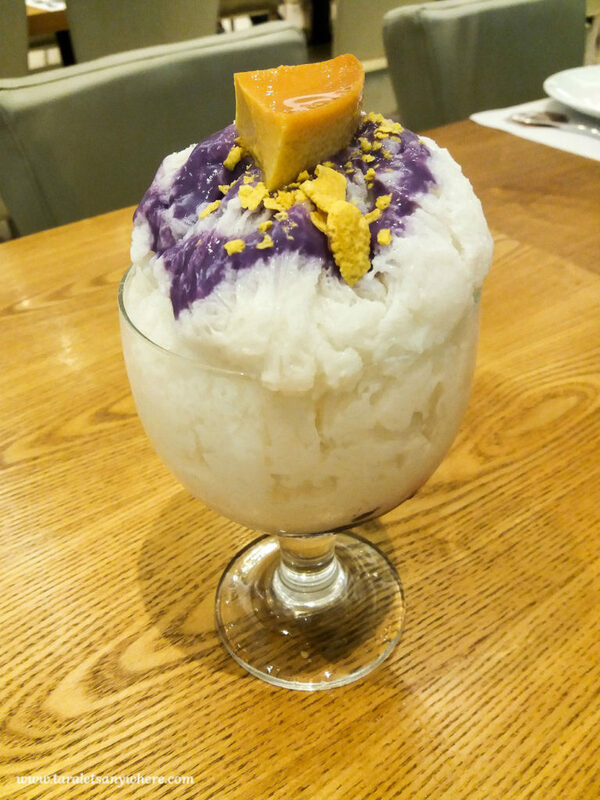 Halo-halo is often topped with ube (purple yam) and a spoonful of leche flan. A scoop or two of ice cream can also be added. A swirl of evaporated milk adds creaminess to this dessert. The essence of halo-halo is that you can change ingredients however you like. Although the number of ingredients may seem overwhelming, the key to making it is adding just a little bit of everything. Halo-halo is the most popular traditional dessert in the Philippines – it’s cold and refreshing, perfect for this little tropical country. It can be bought in small stalls or established restaurants in the country. Binignit is a popular dessert in the Philippines particularly in the Visayas Region. Also called Ginataan in some places in the Philippines, Binignit is a thick and sweet root crop stew widely served during the Lenten Season as meal replacement for devout Catholics who are abstaining from red meat. 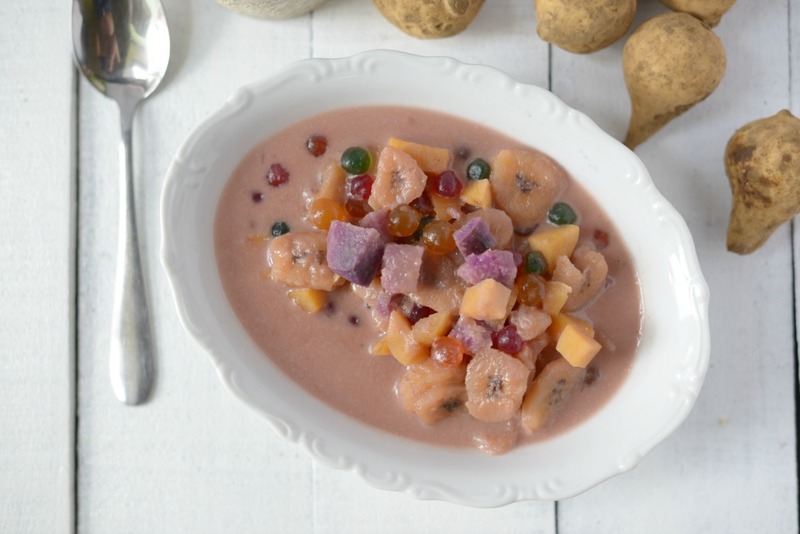 Traditionally, Binignit is prepared with slices of ripe plantains, sweet potato, and purple yam or taro then cooked in coconut milk until the ingredients are soft and tender. Others prefer to add jackfruit, tapioca pearls, brown sugar and palm flour jelly balls to the mixture making the stew thicker. It is typical for Filipino households to cook big batches of Binignit during Lenten Season and share a bowl with their neighbors and friends so if you happen to visit the Philippines during Good Friday or Black Saturday, do not be surprised if people will offer this sweet stew to you. Binignit is also available year-round in local eateries or “carinderia”. For me, no visit to Portugal is complete without a few Pasteis de Nata. 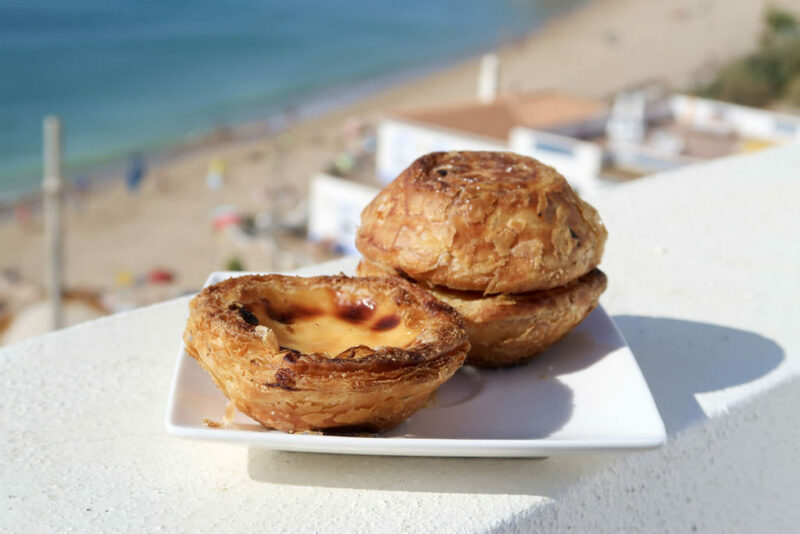 These little custard tarts are popular throughout Portugal and other countries with a significant Portuguese-speaking population. The original Pasteis de Belem were created by Catholic monks before the 1800s as a way to use up egg yolks. In 1834 the monastery was closed, and the recipe was passed on to the original owners of the Fábrica de Pastéis de Belém in Lisbon. They’ve been making Pasteis de Nata ever since. I had my first Pastel de Nata on my first visit to Portugal back in 1991, and fell in love with them immediately. Nowadays, I visit Portugal with my family every summer. That first taste of Pastel de Nata always means that my holiday is officially underway. It’s a pretty amazing combination – pastry that’s both crisp and chewy, filled with a thick, rich, sweet custard. And of course the caramelized top that just about flirts around the edge of being burned. For me, it’s not a proper Pastel de Nata if it doesn’t have that dark brown top. Served alongside a small cup of strong, black coffee, it’s a great pick-me-up that I just can’t resist! With new trends such as cronuts and other hybrids, pastries are become the food of choice for a bit of indulgence. Enter papanași… Papanași is a traditional Romanian desert that deserves to be famous worldwide. 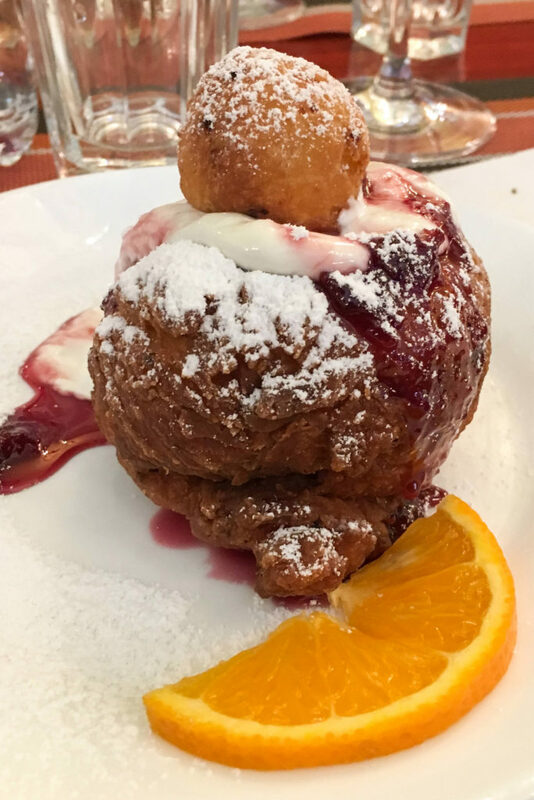 It is a deep-fried kind-of-doughnut (but better), filled with a ricotta-like soft cheese and covered with sour cream and jam. It has a semi-crusty outside and a soft and gooey inside. Absolute heaven! It is found in pretty much every traditional restaurant in Romania, and no meal is complete without it. The best I’ve ever tried was at a restaurant called La Mama in Bucharest’s Old Town. 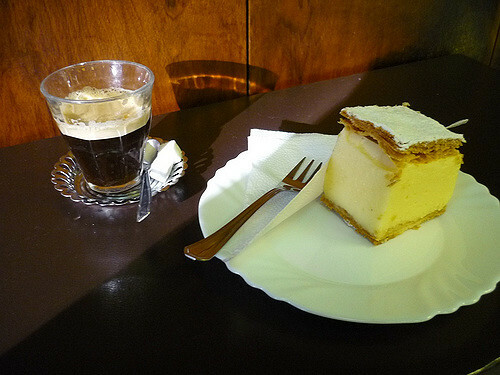 Want a full list of Bucharest’s best desserts? Peter from Where is your Toothbrush? Krémeš is the unofficial queen of fancy desserts in Slovakia. It features a layer of whipped cream atop a thick layer of vanilla custard between a puff pastry base and a thinner puff pastry layer on top. The “French” variation replaces the icing sugar dusting with a coating of chocolate. The dessert is cut into square pieces that stand upright and proud yet delicate and light. It’s very sweet so it goes well with an espresso. Because it’s quite challenging to make, as a child I’d mostly have krémeš on special occasions, for example when the family would go to a pastry shop, like Aida in my hometown Košice. The dessert is popular all over Central Europe: in Hungary it’s krémes, in the countries of former Yugoslavia it’s krempita, in German-speaking lands cremeschnitte. I enjoy trying the many variations wherever I travel in the region. But the one from Aida I got for good grades will always be the best. 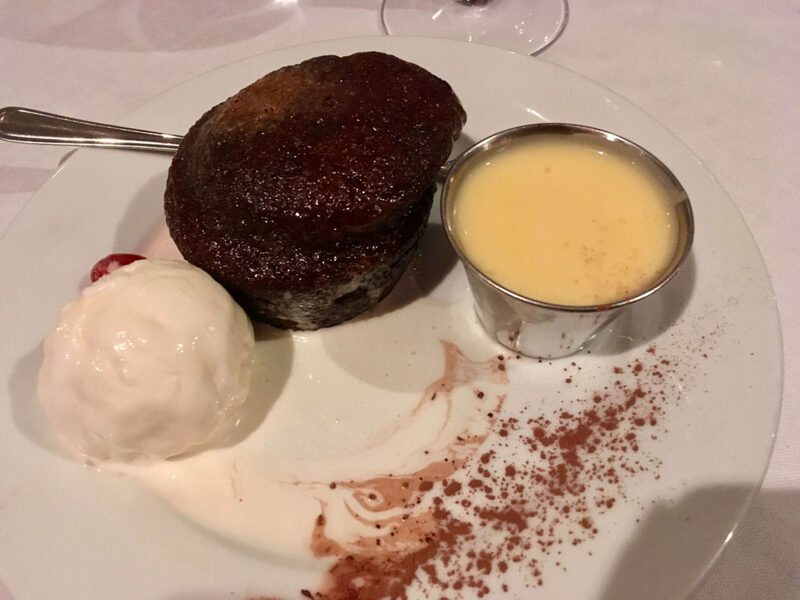 Malva pudding is a sweet pudding of Cape Malay origin and the most popular South African dessert. There are lots to be said in the origin of the name “Malva”. Some say that Malva is named after a woman, while others are saying that Malva is an Afrikaans word for geranium which was one of the original ingredients for the batter. 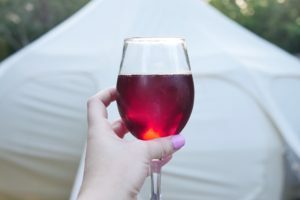 There’s also a theory that it was named after Malvacea wine from Madeira, Portugal as the dessert was normally served with wine after the main course during early times. This gooey and spongy dessert is made of flour, apricot jam, butter, sugar and milk, and is normally served with custard or milk on top and ice cream. I have tried this dessert in one of the best steakhouses in Cape Town and although it’s really sweet for my taste, this pudding doesn’t disappoint! Just make sure to mix it with the creamy vanilla ice cream to balance the sweetness if you’re like me who doesn’t like sweet food that much. Patbingsu (팥빙수) is a popular Korean summer dessert. Traditionally, patbingsu is made with shaved ice, sweet red beans and sometimes topped with fresh summer fruit. It dates back to the Joseon Dynasty (1392 – 1897). Koreans love their red beans. In winter, you can find street vendors everywhere selling fish-shaped pastries called bungeobbang (붕어빵) stuffed with sweetened red bean paste. So yum! But in summer, it’s all about patbingsu. There are plenty of cafes throughout Korea that specialise in patbingsu. You can even buy patbingsu from Lotteria, Korea’s answer to MacDonalds. It’s as common as ordering a sundae or apple pie. We visited a café in Daejeon, a major city about two hours south of Seoul, that serves patbingsu. The patbingsu we ate was nothing like traditional patbingsu. It was so indulgent. We had Oreo-bingsu with shaved ice milk, crushed Oreos, sweet red bean paste, shaved almonds, and topped with ice-cream and a drizzle of chocolate sauce. Even with three of us sharing our Oreo-bingsu, we couldn’t finish it because it was such an enormous serve and so sweet. It cost W8000, about $US7.10. The shaved ice milk was delightful though and very refreshing in the summer heat and humidity, but I think next time we will drop the modern twist and go for a more traditional and less sweet patbingsu. 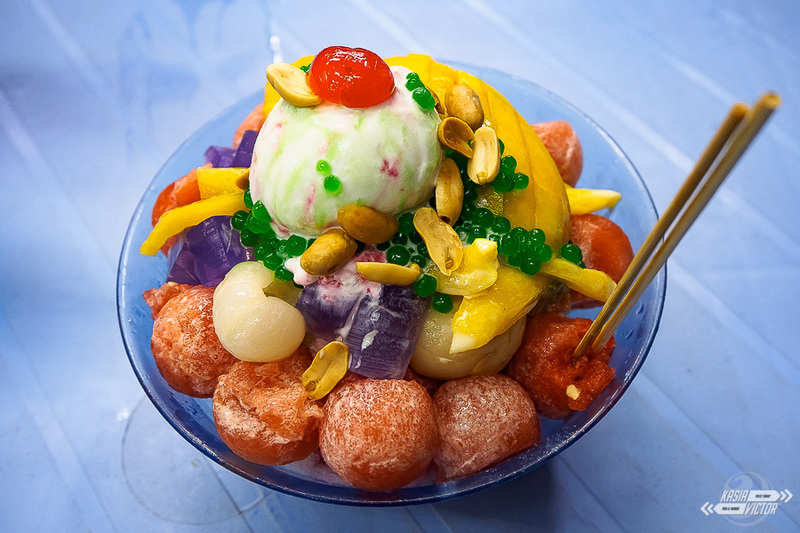 Bingsu is a traditional Korean shaved ice dessert combined with different toppings. The variety of toppings range from fruit, different types of beans, and even cheese! While I was sad that I missed the chance to try bingsu in Seoul, I was happy to have the chance to try it in Singapore from a cute shop called Nunsongyee. 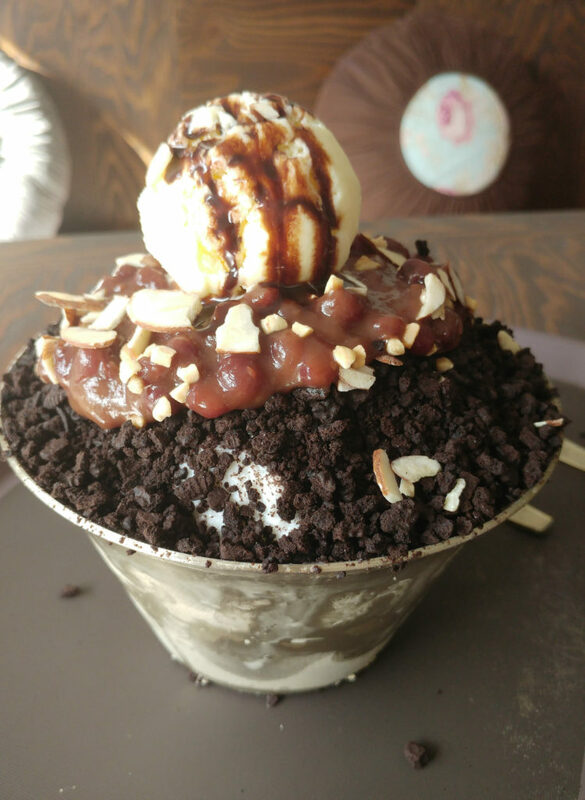 Based in Singapore, Nunsongyee serves bingsu that is quite popular with the locals. We visited this little shop on a weeknight and even then, there were tons of people lining up for this dessert. While most bingsus have fruit and traditional Asian flavours, this cafe took a different approach. 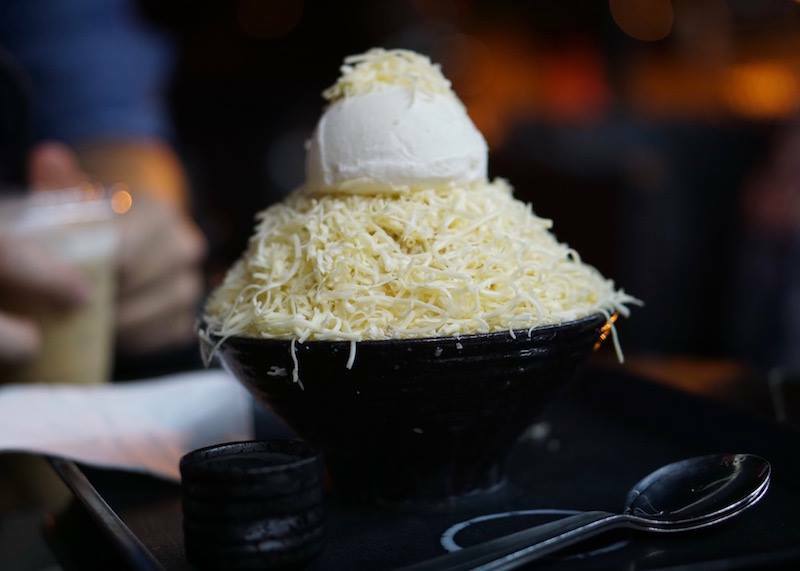 Nunsongyee has a popular bingsu called ‘snow white bingsu’, where cheese is served on top of the ice cream. Being the curious person who likes to try different things, I ordered this dessert and was pleasantly surprised at the sweet and savoury combination. While I would have never expected to have cheese on this shaved ice dessert, I thought it was an interesting twist to bingsu. For anyone who is looking for a refreshing dessert to cool you down, bingsu is one dish that you will definitely enjoy. What’s better than piping hot deep-fried dough? Piping hot deep-fried dough sprinkled with sugar and dipped in warm, rich melted chocolate! Welcome to churros con chocolate, Spain’s national dessert. Food historians are split as to whether churros were an invention of Spanish shepherds or an import from traders who traveled to China. But over the centuries, churros have become embedded as part of Spanish cuisine and culture. They are eaten for breakfast, snack or dessert and prepared in different shapes and sizes (personally, I prefer a small star shape). 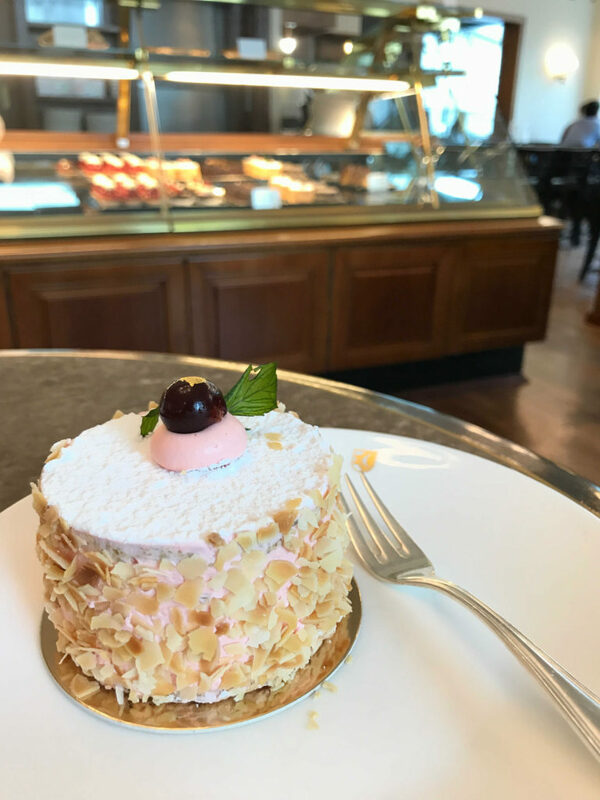 Kirschtorte (German for cherry gateau), especially the Zuger Kirschtorte from the canton of Zug is probably one of the most popular desserts in Switzerland. It is a sponge cake made with hazelnut meringue, butter cream and lots of Kirschwasser (cherry brandy). The Cake is similar to the famous black forest cake but with a white sponge instead of a chocolate sponge. This boozy dessert you can get in most confectionery around the country. But when in Zurich you should visit the Sprüngli Cafe. 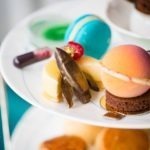 The famous store and coffee house at the Paradeplatz in the city of Zurich were opened back in 1836 by Swiss chocolate producer David Sprüngli.And once you are already here, you may also want to try Sprüngli’s speciality: Luxemburgerli, the smaller Swiss version of the French Macaron. Oh, and of course also try some chocolate! One of the desert delights of the world is Sticky Rice ans Mango from Thailand. My first experience was actually in Australia at our local Thai Restaurant and I instantly fell in love with it. The sweet fresh juicy mango contrasting with the salty sticky rice gives it such a unique meld of tastes which once sampled you just can’t forget. When we visited Thailand in 2011, it did not take long for me to find it for sale and it quickly became our go to desert. Luckily for me, there are stands everywhere selling it and for less than an Aussie Dollar a serve it is a refreshing and delicious way to enjoy local food. It is also simple to make so I know make it at home as well….although nothing beats the first time I tried it. 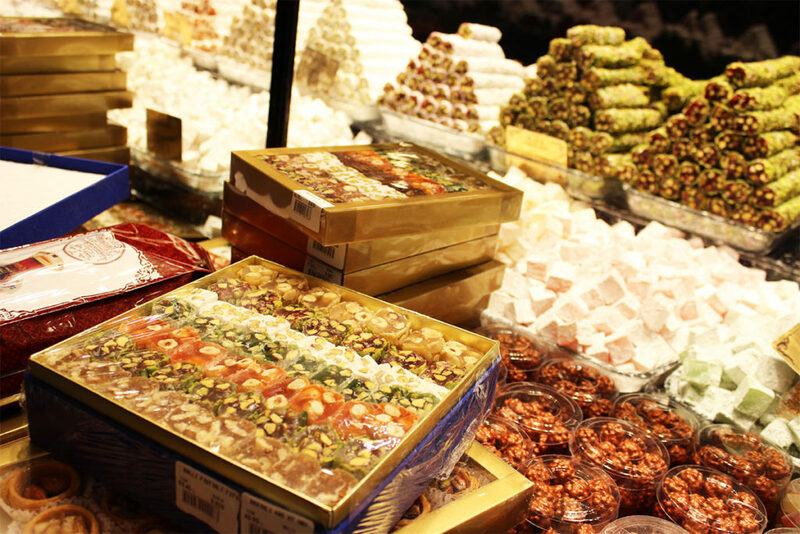 I still remember, my first tryst with the Turkish Delight, also known as Lokum was in the markets of Istanbul. Every shop in Turkey sold boxes of colorful sweets that looked like jelly. Before I could ask a local about its significance and popularity, I was at the Grand Bazaar in Istanbul. Known for its hospitality as a key selling technique, I landed in one of the shops only to be greeted with some Apple Çay and a plateful of Lokum. Lokum or Turkish Delight as they call it, is like a gel of starch and sugar that comes in various flavors. It is sweet, but not too much despite being coated with powdered sugar. The Turkish Delight is popular as the sign of Turkish hospitality and is an addictive dessert to snack on. It is available all across the country, fresh and packed available in a range of flavors and prices. Once you taste it, you shall know why the Turks swear by it. I soon found myself at Hafiz Mustafa, the finest sweet shop in Istanbul known for its preparation of Baklavas and Turkish Delight. Their staff was generous enough to understand my excitement and allowed me to test a range of their flavors. I loved the chocolate, lemon and pomegranate flavors. But did I pick just one? Nope. I took back numerous boxes of assorted Lokum for friends, family and myself. Thanks to its long shelf life and dry nature, it was easy to pack and carry. It was only befitting a memory of the great Turkish culture and hospitality. I tasted this Arabic version of doughnuts during a trip to Dubai earlier this year. A batter is made before deep frying in oil before dipping into a sugar syrup and toasted sesame seeds sprinkled over.I was a guest at the Palace in Downtown Dubai and having dinner at their Arabic Food themed evening.Outside the buffet area there was a local Emirati woman making the Luqaimat.The most interesting thing was that she was sitting on the floor making this with a steel mouth piece to protect her mouth from the boiling hot oil.There is nothing better than eat a soft pillow of fried goodness soaked in a sugar syrup. There are several versions of this dish served throughout the several Emiratis which is a popular sweet served for Iftar( breaking fast) during Ramadan. 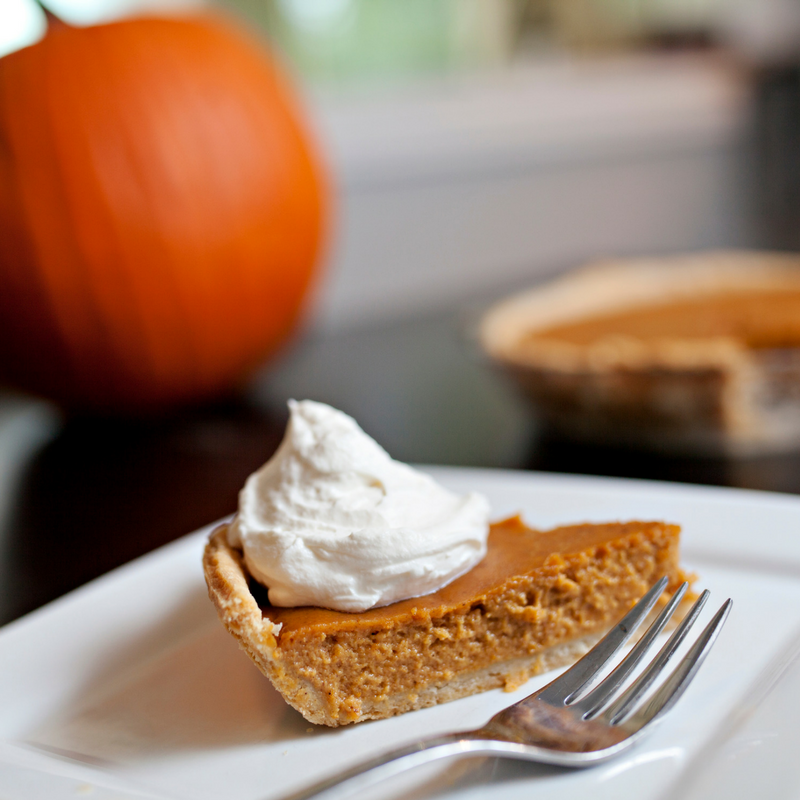 Pumpkin pie is a traditional American dessert, that has come to be synonymous with ‘Thanks Giving’ in the USA and Canada. ‘Thanks giving’ is a day of giving thanks and for the blessing of the harvest of the previous year. It is celebrated in late November, which is in the Fall (Autumn) for the Northern Hemisphere. So now down to the nitty gritty on how I actually tried this dessert all the way in Australia. I was introduced to pumpkin pie, by my cousin’s husband, who is from the USA. As a treat, they invited the extended family around to celebrate this American holiday, here in Australia. I was actually really excited to try the pumpkin pie for the first time. My cousin made the pie from scratch, with a pumpkin custard filling and a mixture of spices such as nutmeg, cinnamon and cloves to add some aromatic flavour. Then you add a dollop of cream or even better ice cream, and you have got yourself an American dessert. The seasons might have been out of whack, but all in all the celebration kept to tradition. No matter what season, I think you could enjoy this dessert all year round! So the verdict? Well I actually thought it was absolutely delicious. Well, to be honest, I haven’t come across a dessert that I didn’t like, so I knew I was going to like it! Have you tried Pumpkin Pie? 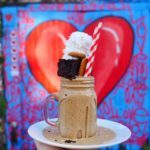 Check out these awesome desserts in Dallas, Texas. Chè ba màu is a popular Vietnamese dessert. The name translates to “three color dessert”. 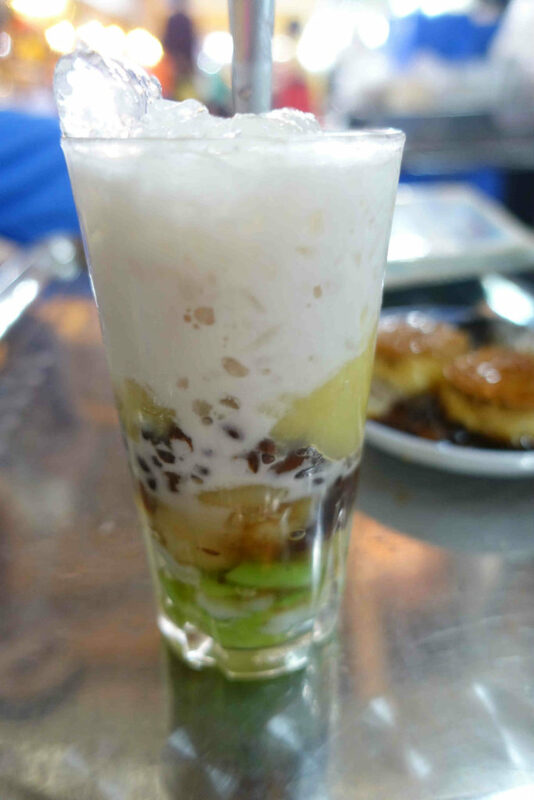 It consists of red bean, mung bean, pandan extract, topped with a coconut cream sauce over ice. On our last trip to Vietnam, our first stop is always Ho Chi Minh City. We love going to the famous Ben Thanh Market for food and shopping. We got lured into a food stall for one of our favorite desserts, che ba mau. This was the perfect dessert break for a hot, hectic day in Ho Chi Minh City. You cannot go to Vietnam without trying this dessert! How many of these desserts from around the world have you tried? Have we missed your favorite traditional dessert? Let us know in the comments! 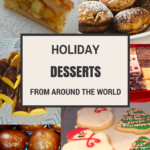 If you loved this post, I think you’ll enjoy learning about the sweets eaten during the holidays around the world. 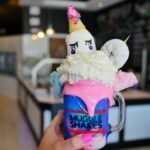 Desserts in Brighton you don’t want to miss! As a person with a serious sweet tooth, I loved this post. I will travel just for dessert! That’s my kind of travel, too! Can’t wait to try all of these desserts! Thanks so much for contributing!! 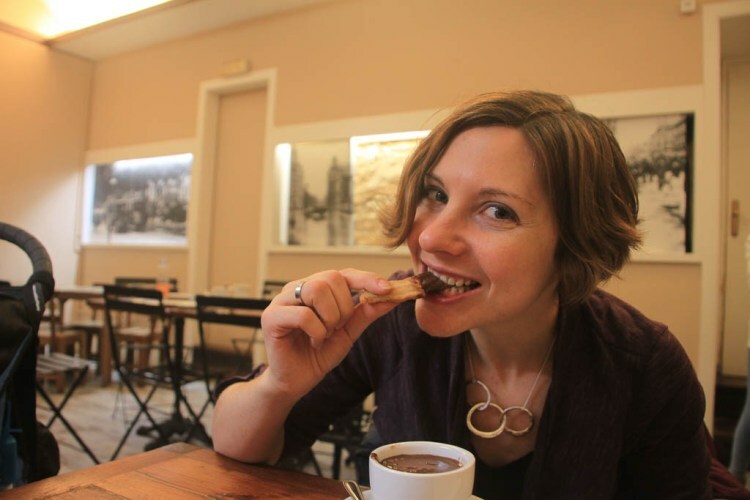 I love your blog and hope to meet you somewhere around the world for a dessert! Not on the computer!! Haha! You just made me hungry! I love trying the local foods whenever I´m travelling – I don´t have too much of a sweet tooth but I can’t resist a creme brulèe – or an Eton Mess when I´m at home in the UK. After travelling through the states recently though I can confirm that the North Americans definitely know their desserts! These really look fantastic, I have booking to Malaysia and Singapore this August, I will make sure to try Ais Kacang mentioned in the blog. It is a very informative blog. Thanks for sharing. Pumpkin Pie is my favorite food. 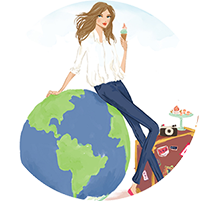 This post shows me that I clearly have more traveling and dessert eating to do! Thank you for this content. Oh my goodness! I loved this sweet journey. I have made many if these desserts and look forward to trying more. Thank you for bringing us along your sweet travels. I’m so glad you enjoyed the post 🙂 Happy baking!! 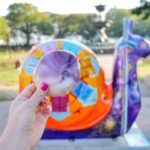 Welcome to my first blog post here at The Sweet Wanderlust! 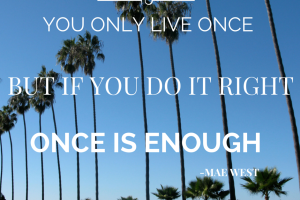 To get started… I’ve added some of my favorite quotes to a few of my favorite photos I’ve taken during my travels to encourage you to live life to the fullest!